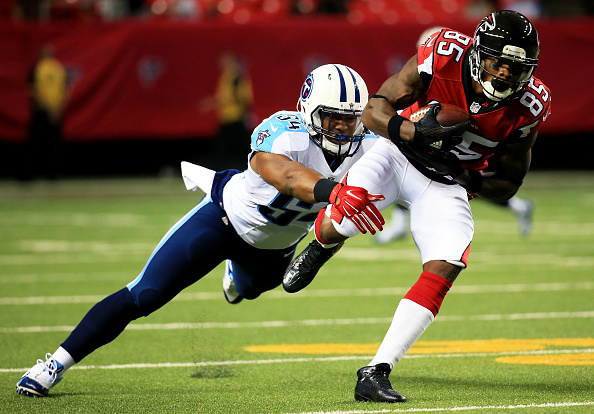 Things for the Tennessee Titans haven’t gone that well since they started the season red hot in their win against the Bucs on opening day, and they would need a major effort Sunday at home against the on fire Falcons to turn things around. Marcus Mariota, the second overall pick in this year’s draft, began his career by throwing four touchdowns in the opening day win, but he and the team have struggled since. Last week in a blowout loss to the Dolphins he was sacked five times and Dolphins defensive end Olivier Vernon hit him low in the second quarter. The QB stayed in the game and finished with four turnovers, but an MRI on Monday revealed a sprained left MCL. “You got to be able to show that you buy into what’s going on here, and I’m going to do my best to make sure that I’m prepared and hopefully can go on Sunday,” he said. It’s probably not going to matter, as the Falcons are steamed after losing their first game a week ago Thursday, and will be looking for a quick rebound. Atlanta lost to the rival Saints 31-21, and need to shore up their defense which right now is ranked 20th in the NFL allowing 369.5 yards per game. Running back Devonta Freeman has been the catalyst for the NFL’s fourth-ranked offense, which averages 407.3 yards per game. His 10 total touchdowns are four more than anyone else in the league, and he’s rushed for at least 100 yards in three of the last four weeks, including exactly that many on just 13 carries against the Saints. Look for another huge outing from the back vs the Titans, who rank 28th in the NFL in yards allowed per game on the ground. Freeman and QB Matt Ryan should be able to pile up the points, and it’s unlikely that the Titans offense, which has had issues since opening day, are going to be able to keep up. These teams haven’t met since Ryan threw for 316 yards and a touchdown in Atlanta’s 23-17 home win in 2011, and Ryan and the Falcons offense are going to have a field day against the Titans. Look for Tennessee to fall again at home, as the Titans have lost eight consecutive home games overall and are 1-10 in Nashville under coach Ken Whisenhunt. That streak will continue Sunday. Want to make some fast this this weekend?! Get in a great one day fantasy league and get paid right after you win – play now!